Thiru Thanjaimamani Koil is one of the 108 Divya Desams of Lord Vishnu located on the river banks of Vennar in Thanjavur, Tamil Nadu. The three Temples of Lord Sriman Narayana positioned here are Sri Neelamega Perumal Temple, Thiru Manikundram and Thiru Thanjayali temple considered as one Divya Desam. Brahmanda Puranam describes the grandeur of this sacred land. The three Vaishnavaite saints Thirumangai Alwar, Boothathalwar and Nammalvar sung praising the glories of Lord Sriman Narayana in this temple. The legend has that in Kritha Yuga there were three demons Thanjakan, Thandakan and Gajamukhan underwent severe penance praying to Lord Shiva. Lord Shiva was pleased at the devotion of the three demons and appeared before them. The demons requested for a boon of immortality to Lord Shiva. Lord Shiva advised them that Lord Vishnu as a Preserver could provide such a boon. However Lord Shiva provided them with a boon that he will do no harm to them. The three demons were turned out haughty with the extra-ordinary boon provided by Lord Shiva and they started harassing entire deities and Rishis. In the meantime, the entire universe had undergone severe drought and famine. Surprisingly, there was only one sacred land remained undisturbed where Sage Parasara was following severe austerities and propitiating Lord Hari. The three demons arrived on this land; they started assaulting Sage Parasara and tried all their arrogant means to vanquish him from this lush green land. Sage Parasara called out for Lord Hari loudly for help. Instantaneously, Lord Sriman Narayana sent Garuda to kill the army of demons. At last, Lord himself appeared before the demons and beheaded all of them. Thanjakan regretted about his deeds and begged to pardon him. Thus, the sacred land has got its name Thanjakanur and later years came to known as ‘Thanjavur’. The demon Gajamukhan appeared as an elephant (Yali) and entered in a battle with Lord. Lord Sriman Narayana took the form of a half-man and half-lion form (Lord Narasimha) and killed him. Gajamukhan also regretted at his misdeeds and begged to pardon him. Thus, this place came to known as ‘Thanjayali’. The demon Thandakan found shelter in Patal Loka, Lord took the form of a wild boar (Varaha) plunged into Patal Loka and killed him. He also realized his stupidity and begged for pardon. The place where Thandakan was got killed came to known as Dhandakaranyam. Lord appeared as ‘Bhuvaraha Murthy’ on the Earth after beheading Thandakan, this sacred place is known as Thirumuttam – Srimushnam. Finally, the most compassionate Lord provided all three demons with salvation. Mother Mahalakshmi on the left of Lord of Narasimha is on His right in the shrine at Neelamega Perumal temple prakara in sitting form. This Narasimha is also called Valavandhai (right side) Narasimha. Lord Narasimha was in high fury after killing Hiranya. As Mahalaskhmi would be absent in places dominated by anger, She has chosen the right side, it is said. It is advised that those of short tempered nature should correct themselves if they wish to have the grace of Mother Mahalakshmi. Lord Vishnu who destroyed the demons graces in three separate temples as Neelamegar, Manikundra Perumal and Veera Narasimha in three forms. Saints Boodhathazhwar and Tirumangai Azhwar had sung the glory of the three Perumals together in their hymns. The three temples form a single Divya Desa. Saint Tirumangai Azhwar had sung the Mangalasasanam twice for the temple. Lord Veera Narasimhar blesses the devotees from the sanctum sanctorum along with Mothers Sridevi and Bhoodevi. Instead of abishek only Thailakappu is done for the three presiding deities. As procession deity, Neelamega Perumal is holding the Sengol-the royal stick of authority. Procession Mother is wearing a crown of Fire but soft and smiling in look. Sage Parasara is in the sanctum in worshipping posture. Lord Hayagriva the authority of Wisdom is facing north with Mother Mahalakshmi the Goddess of Wealth. Devotees worship Lord and Mother offering cardamom garlands, light ghee lamps with sugar candy as niedhana to gain academic excellence. Presiding Lord appears in a sitting posture. The Lord is Veera Narasimhar in Singaperumal Koil. Sri Yoga Narasimha is in the front Mandap. Also Sri Lakshmi Narasimha is in the prakara of Neelmega Perumal temple, Abhayavaradha Narasimhar on the Garudazhwar Vimana and Kambathadi Yoga Narasimha on the pillar of Thayar shrine. Thus there are Five Narasimha Lords in the temple. Perumal temple is open from 8.00 a.m. to 11.00 a.m and from 5.00 p.m. to 8.00 p.m. To visit the other two temples, the devotee has to take the priest with him/her. 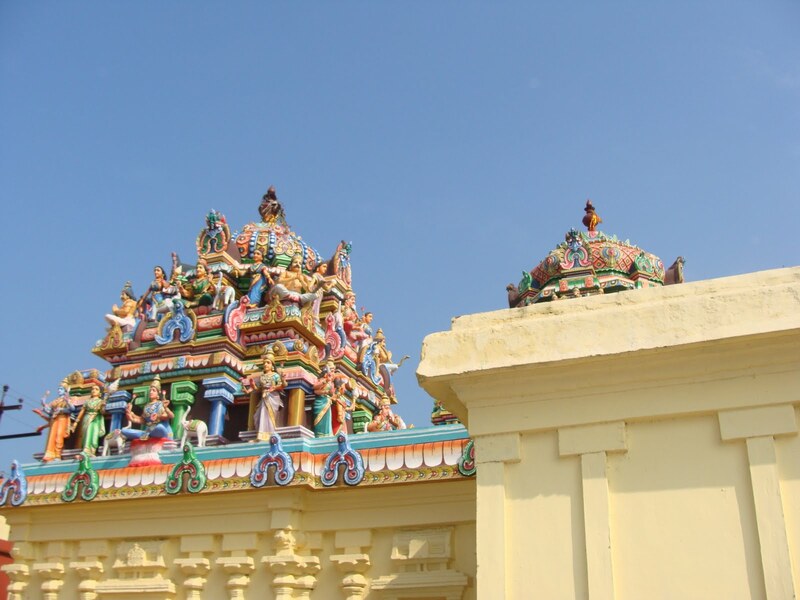 Singaperumal koil is 3 km from Thanjavur old bus stand on the Kumbakonam route. The three temples are nearby to one another. S/o Sri Srinivasa Battachariar (Sri Rangam).